We are excited to celebrate the New year with you! 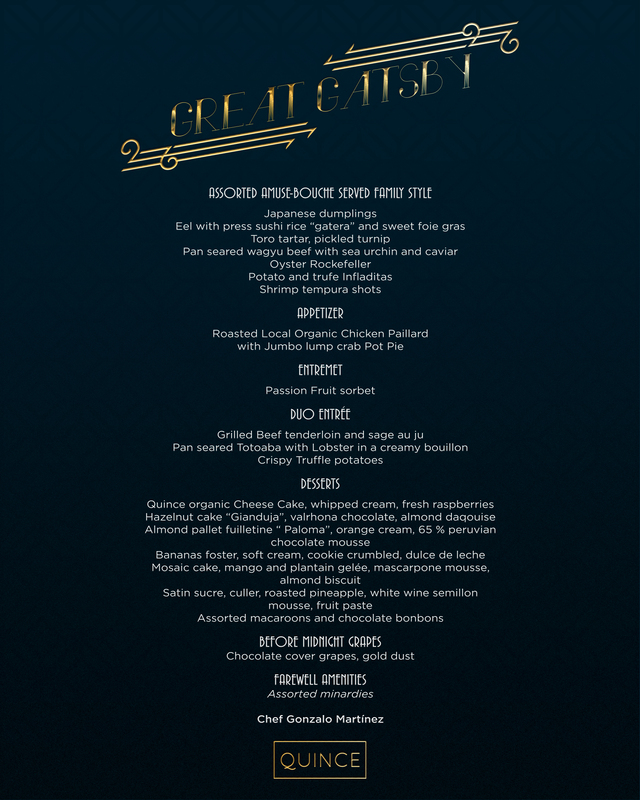 We have something extra special this year… a 20’s GREAT GATSBY casino party! Chef G. Martinez is preparing an exquisite meal for this event and our top 10 ranked mixologists will be ready to serve you with an open Premium Bar (including Dom Perignon, Veuve Clicquot, Casa Dragones tequila and many other top brands). Among many other surprises, the entertainment includes two of the top Mexican and Italian DJ’s and Quince’s pop-up Casino(for prizes). To make your reservation, fill in the form below or send an email with the same details to reserve@quincerooftop.com to inquire. (Note, we should respond in les than 24 hours). You can also Whatsapp us by clicking this link QUINCE WHATSAPP to inquire.